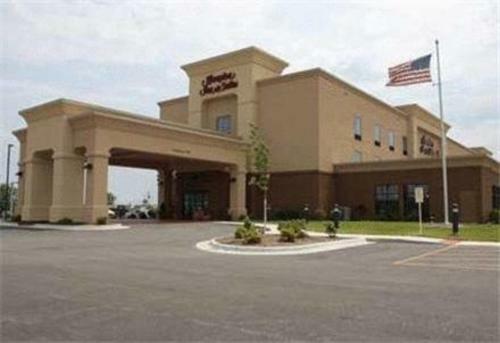 This Moline, Illinois hotel offers a free breakfast and free high-speed internet access. John Deere Headquarters and the Niabi Zoo are a short drive from the hotel. Every room at the Hampton Inn & Suites Moline-Quad City International Airport comes equipped with cable TV and a coffee maker. All rooms include a work desk and bath amenities. A fitness room and an indoor pool are on-site at the Moline Hampton Inn & Suites hotel. The hotel offers a breakfast area and luggage holding is available. The Rock Island Arsenal Museum is just minutes from the Moline-Quad City International Airport Hampton Inn & Suites hotel. Rhythm City Casino is also within driving distance from the hotel. the hotel Hampton Inn & Suites Moline-Quad City Int'l Aprt so we can give you detailed rates for the rooms in the desired period.